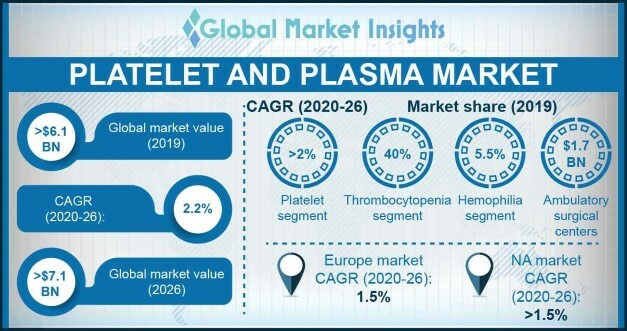 Platelet and Plasma Market size is set to exceed USD 6.5 billion by 2024; according to a new research report by Global Market Insights. Increasing prevalence of chronic diseases such as liver cirrhosis, non-alcoholic steato-hepatitis (NASH) hepatocellular carcinoma and other liver diseases will fuel the market growth during the foreseeable years. Liver diseases are the fifth most common cause of mortality across the world. According to American Association for the Study of Liver Diseases, in 2014, liver diseases such as alcoholic liver disease, viral hepatitis and nonalcoholic fatty liver disease affected more than 300 million people in China. Geriatric population is susceptible to various liver diseases owing to functional limitations growing with age. Growing cases of liver diseases coupled with rising geriatric population base will stimulate the demand for platelets and plasma for treatment of aforementioned liver diseases thereby augmenting the platelet and plasma market growth. Growing number of blood transfusions globally is another impact rendering factor for the growth of platelets and plasma market. According to European commission’s 2017 annual report, more than 25 million units of blood and blood components were being issued for the purpose of transfusion in Europe. Blood transfusion is an essential medical procedure that plays a crucial role for supporting different healthcare specialties across the world. Isolation of blood components such as red blood cells, platelets, plasma and other essential components of blood is primarily done through blood transfuion. Increasing blood transfusions will consequently drive the platelets and plasma market over the forecast period. However, stringent regulatory policies pertaining to plasma collection and escalating price pressure will impede the market growth over the forecast period. Hospitals segment is estimated to grow at 2.2% CAGR during the forecast period owing to increasing number of patient visits in hospitals for treatment of various diseases. Rising number of road accidents and trauma cases will fuel the segment growth over the analysis period.